The intoxicating aroma of roasting nuts and maple, fill the house with this recipe. Crunchy and delicious would be the best way to describe these. We used this to decorate or Carrot and Zucchini Cupcakes, but you can use them for many purposes. We ate the left-overs by the hand-full. Preheat oven to 350°F and line a baking sheet with foil. Melt butter in the microwave, then mix in the maple syrup and brown sugar until sugar is melted and mixture has no lumps. Using a fork, toss pecans (a little at a time) with the mixture and spread evenly on a foil lined baking sheet. Bake at 350°F for 10-15 minutes, mixing them half way through, or until pecans are toasted evenly. To test doneness, remove a pecan and allow to cool for 30 seconds (or more) and taste. 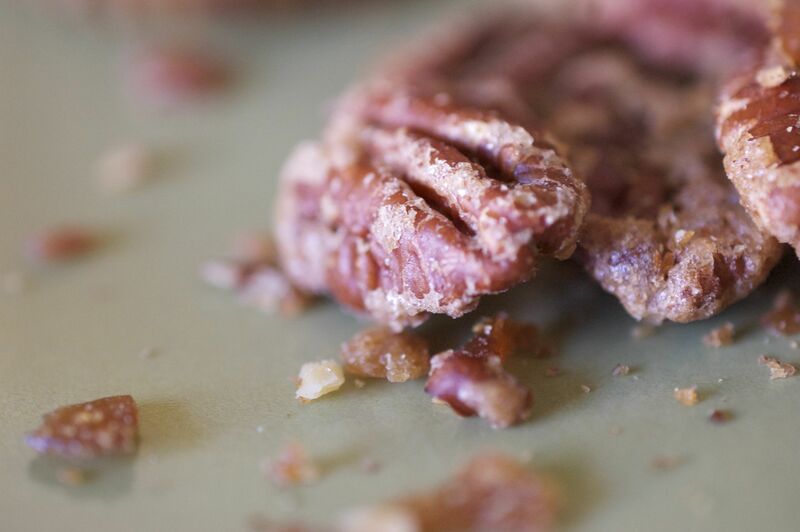 Pecans should be crunchy, and the coating will be candied and not moist. What’s the best way to store to keep fresh And how long should you keep them out cooling before putting in a container? When they are cool/room temp? Allow to cool to room temp before storing. Store in an airtight container at room temperature for up to a week for best freshness.